Hi there! 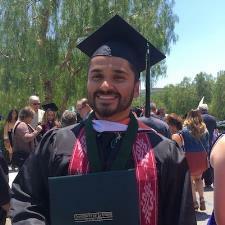 I graduated from the University of La Verne (ULV) with a Bachelor's degree in Educational Studies. I aspire to be a science teacher for middle and high school students. I have 3 years working with children. I was a camp counselor for the summer of 2015, a middle school tutor and am currently a part time therapist for children with Autism. I enjoy helping children of all ages and have a strong background in math and science. Prior to transferring to ULV, I studied mechanical engineering in Arizona for three years and after finding my true calling to become an educator while on mission in Southeast Asia, I switched to what I am doing now: becoming a teacher. I love using the student's natural curiosity to enhance their abilities of the subject and help improve their struggles. I want to become an educator who is a positive role model that encourages lifelong learning, inspires others to reach their dreams, sparks motivation and emboldens the meaning of integrity. I am eager to utilize what I have learned from my experiences and give my best effort to help others achieve their goals. I look forward to applying the curiosity that children so abundantly have and use it towards generating an excitement and interest in the classroom. I studied mechanical engineering for three years at a prestigious university in Arizona. While there I studied advanced math surpassing calculus 1,2, and 3 as well as differential equations. While studying mechanical engineering in Arizona, I took courses in all basic physics, electrical circuitry, thermodynamics, fluid mechanics, heat transfer, alternative energy, computer programming and dynamics. Even though I took advanced physics, I have a strong understanding of biology and astronomy as well. So when it comes to math and sciences and even geography, if you have an upcoming test, ACT, SAT, or just having trouble with several topics in class that are still unclear, don't worry, I can help! I am available every day Monday-Sunday. I have a strong background in algebra and other maths from my 3 years as an undergraduate studying engineering.